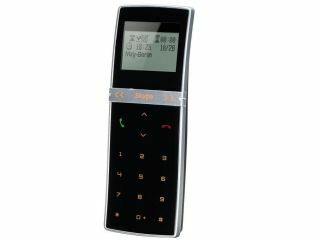 Undoubtedly one of the nicest looking VoIP handsets we've seen in a while, Amex Digital 's new touch-screen Skype phone boasts a slick, touch-sensitive design. The new TSP-VS501 will use the same touch-technology Amex has used on its touch-screen keyboards , Japan-based Akihabara News has said. It's compatible with Windows XP and 2000, holds 160 entry phone book entries and has 16kHz audio sampling. It can also be used as a standard landline telephone. Although it's only a Skype phone for now, Amex has said it will develop the TSP-VS501 for other VoIP operators in the future. We're unlikely to see it released in the UK, as Amex - a company specialising in bespoke media PCs - has yet to confirm any UK details.